It won’t have escaped your notice that when it comes to buying a caravan, there’s quite a wide selection to choose from. That is not just in terms of size and style. As a result, we’ve published several different posts around the subject of buying a caravan. Our Ultimate Guide to Buying a New Caravan is a very comprehensive look at everything you need to consider, while Why Should You Part Exchange Your Caravan, looks at one of the many alternatives to buying completely new. We’ve also looked at the subject of Caravan Vs Motorhome and the Costs of Owning a Caravan beyond the purchase. At Caravan Helper, we’ve covered in past posts and sections the fact that there’s different sizes and styles of caravans. 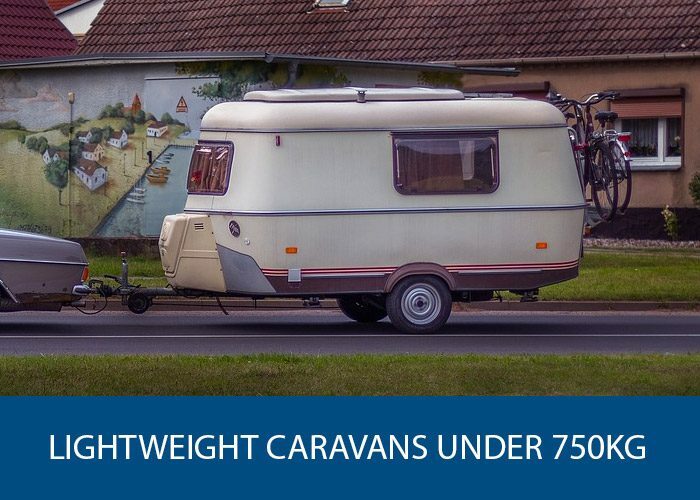 One topic we’ve yet to cover though is lightweight caravans under 750kg and if you’ve always wondered whether they were worth it or not, you’ve come to the right place as that’s what we’re going to discuss in the following post. 1 Why Consider Lightweight Caravans Under 750kg? Why Consider Lightweight Caravans Under 750kg? Although you may be thinking that you’d want to buy the largest caravan possible, because larger means more comfort, right? Well, the biggest difference between a caravan less than 750kg and one more than 750kg, is just that – the weight. Many of them have the same facilities, have space to sit and space to lie down. Because the washroom area tends to be the part that adds a lot of additional weight, you may not have a shower or toilet. It just depends on the brand and model you purchase. Towing a caravan can be an intimidating experience, especially if you’ve never done it before. Country lanes, motorways and even reversing can be challenging to say the least. That is, if you’ve got a standard sized caravan. Lightweight caravans are a whole lot easier to tow and as some of the lightest on the market are also narrower than standard tourers, it’s possible to tow them without using a towing mirror. If you’ve got a small car and have been looking only at standard and larger caravans up until this point, you may have been contemplating investing in a new car. Which is something you may want to avoid if you’re on a tight budget, as having to buy a new car (or one that’s at least new to you) as well as a caravan, amounts to quite a lot of money. With a lighter caravan, like one of the many out there under 750kg, however, there’s no need to have a large towing vehicle. Consider the fact that you’ll only be towing it around 10 to 20% of the time anyway. That means with a lightweight caravan, you will be okay using a standard family car or even smaller, without any trouble at all. There’s even been some lightweight caravan owners who tow their tourer with a motorbike! Following nicely from the above, it’s worth expounding on the fact that it’s a lot easier to manoeuvre a lighter caravan. For those over 750kg, if you don’t have a good quality motor mover, it’s a lot harder to manage, especially when trying to reverse and get into place at your pitch at the site. A problem that you just don’t have with lightweight caravans. When it comes to the choice of caravan sites, you’ll come across restrictions for larger models. Whether it’s that the pitching space is not quite big enough or there’s just no room to manoeuvre properly with a bigger caravan, you won’t have the same problem with a smaller tourer. That means you’ll have even more choice and flexibility about where you can go on holidays with your caravan. You’ll always need to store your caravan away somewhere when it’s not being used. With a standard or larger tourer, however, that normally means investing in a spot at a local storage facility. Lightweight caravans are often small enough to park on your drive, if you have the space. That means you don’t have to make regular trips to check on it and can just handle all maintenance, repairs, cleaning and setting up from the comfort of your own property. However, even if you don’t have the space to store your lightweight caravan on your property, as the price of storage is often determined by caravan size, you’ll still be at a distinct advantage for having a lighter model. If you’re keen to learn more about the lightweight caravan options out there, we’ve highlighted a couple of the most popular manufacturers and their best tourers. Freedom Caravans has been in business for over 30 years and in that time have had a prominent place in the tourer marketplace as the leading manufacturer and supplier of lightweight caravans. All their tourers, according to their website, have MTPLMs ranging from just 680 to 850kg and unladen weights of 580 to 680kg. Freedom by name and by nature. If you were worried about the facilities and features you might have access to with caravans lighter than 750kg, there’s really nothing to worry about with Freedom Caravans. All their models come complete with tinted double-glazed windows, three-way fridges with an icebox and a gas hob. The more expensive models have additional features like showers, toilets and sinks, hot and cold water, skylights and blown-air heating. Another great feature of Freedom Caravans is that they’re extremely watertight and made from six panels of fiberglass that are clamped together and then the resulting joints are fibre glassed so that you have just one shell. The first of the three Freedom lightweight caravans we’ve highlighted is the Jetstream Twin Sport. This is a beautiful-looking tourer that is affordable and equipped with an exciting number of features. You get a full-length single bed as standard and despite the number of features, mentioned below, it weighs around 750kg. The Freedom Sunseeker has a very airy and light feel to it that makes it perfect for life on the road. It’s the largest 3-berth caravan in the company’s range and has space for a single and double bed that convert into sitting and dining space. One way that this is different from the above, you’ll notice, is that there’s no toilet or sink area. For the amount of space, you get though, that may be a compromise worth making. The last Freedom lightweight caravan model we’ve highlighted is the rather awesome Microlite Discovery LE. This still manages to remain a classic pop-up caravan that weighs 750kg with an attractive finish and whole host of features. Adventure Leisure Vehicles as originally founded to bring Airstreams to the European market in 2005. The most compact and lightweight models in the wide range of caravans that Adventure Leisure Vehicles manufacture, and supply are the rather cool TAB caravans. Based on the iconic teardrop caravan design, these are the ultimate in small space living, as they still manage to pack an amazing number of features and facilities into such a small space. For example, all the models include kitchenettes, living spaces and a bed. There are two-berth editions that are perfect for any couples who want to hit the road together or if you’re riding solo and just want a more luxurious and relaxing place to setup your home away from home. The TAB model we wanted to highlight a little here is the TAB 320 Off Road caravan. This is very similar to the TAB 320, with the major difference being described in its name – it has special off-road tyres that will help you to navigate across various terrains, particularly those unfinished and makeshift roads you get in and around some sites. Ideally this would work well in an outfit that included a 4×4 or SUV towing vehicle. It remains a similar size to the other models in the range and has the same facilities too. Also, worth considering is the TAB 400. So, whether you’ve been planning to invest in a lightweight caravan for a long time or have only just come across the idea recently. Even if you’ve been on the fence about them, we’ve hopefully been able to show you that there are many great benefits to opting for a lightweight and smaller caravan rather than a large and heavy behemoth. As well as costing less upfront and to run them, they’re also far easier to tow and despite their size, are just as reliable, robust and filled with features and facilities as full-size models.